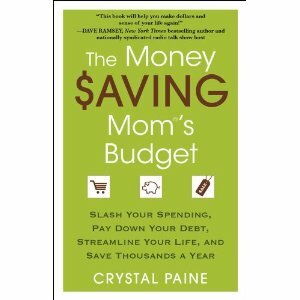 Mommy-money blogger Crystal Paine distills her best financial advice and secrets from her blog MONEY SAVING MOM®, to help families get their finances in order. Based on The Money Saving Mom’s Seven Rules for Financial Success and written in a simple, straight-forward style, this book offers an easy plan for a complete financial makeover. In the first few chapters, you'll learn how to set big financial goals and actually follow through with them, how to organize your home and life so you can have more time to focus on getting your finances in order, and how to implement a realistic cash budget system that can transform your financial situation. After laying the foundation for financial success in the first few chapters, Paine then teaches you step-by-step how to cut your grocery and household expenditures by 30% to 50%. You'll learn both basic and advanced couponing techniques, 25 practical ways to save money on groceries without clipping coupons, how to buy prescription glasses for under $20, how to dress your children for free, and much more. The book will be released January 12, 2012. But you can pre-order your copy here for only $10.99 (+ shipping). Christmas shopping with FREE shipping! Light Up Night in the 'Burgh! Family Getaway - 39% off!